Fellow hacker and all-around rock-star Sherri Davidoff and I have been chatting lately about a new form of privacy loss from Amazon in the form of the Kindle. 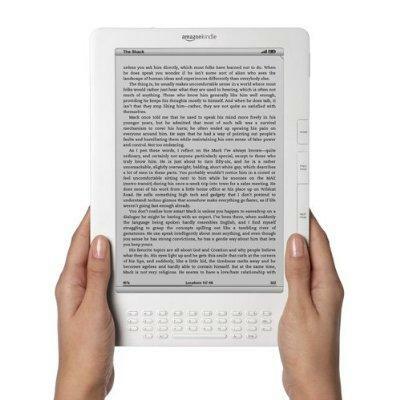 I’m a big Kindle user, and I love having a good deal of my tech library with me on the Kindle DX when I travel. When I’m on-site with a customer and want to reference something from the Database Hacker’s Handbook, for example, I can buy and download it in a minute. The alternative is to find a Border’s, drive there, buy the book, drive somewhere else because the first store didn’t have it, drive back to the customer and waste precious on-site engagement time. With the ability to read full 8.5×11 PDF’s as well (the ZigBee-2007 PDF is keeping me busy at the moment), it’s well worth the cost of the unit. However, it turns out that the Kindle keeps track of what you read. Presumably, this is just for synchronizing your last-read page across e-readers, but I suspect a company that recognizes the value of customer information such as Amazon wouldn’t let this be the only thing they collect about their e-book users. Check out Sherri’s post on this topic on philosecurity.com. Privacy loss often comes in convenient forms; TiVO cataloging each second of TV you watch and skip, the Nike+iPod leaving a RF breadcrumb trail for where you go and who you associate with and many other examples. If anyone knows what Amazon’s policy is on the information they collect about Kindle users, I’d love to hear it. 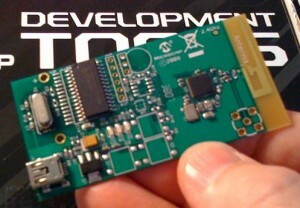 I’ve posted my IEEE 802.11 pocket reference guide to the Projects Section. This legal-sized guide provides some quick-reference resources for wireless analysis including common acronyms, Wireshark display filters, Kismet shortcuts and a breakdown of several of the IEEE 802.11 header fields. This will be especially helpful to my SANS SEC617 Ethical Hacking Wireless students! New slides I’m delivering tonight at the SANS Denver 2009 conference on using Kismet Newcore for wireless assessment in the role of wireless network administrator, auditor or ethical hacker. Check it out in the usual place. Thanks to @jabra for his help in getting the BT4 update repository current with the most recent Kismet Newcore fixes. Fewer restrictions on collecting the data needed to mount an attack. The default behavior requires all 4 frames of the 4-way handshake to mount an attack. If you specify “-2” on the command-line, coWPAtty will only require frames 1 and 2 of the 4-way handshake to mount an attack. More on this below. Validate that the needed information is present to mount an attack, without launching the attack (the “-c” option). This was requested by Pure Hate for an awesome project he gave me a preview on. I’m hoping details of this project will be public soon. The “-2” option also includes fewer restrictions for validating the content of the packet capture. This was implemented by a patch submitted by Nathan Grennan, accommodating some AP’s that do not strictly adhere to the IEEE 802.11i/IEEE 802.11-2007 specification. Removing the restriction of needing all 4 frames of the 4-way handshake to mount an attack has some interesting implications. 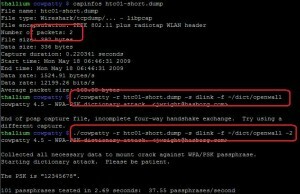 First, packet captures taken while channel hopping often miss parts of the 4-way handshake, since they can hop in the middle of the 4-way handshake exchange. Relying on only frames 1 and 2 gives you a better chance of catching the needed data even if you are channel hopping. 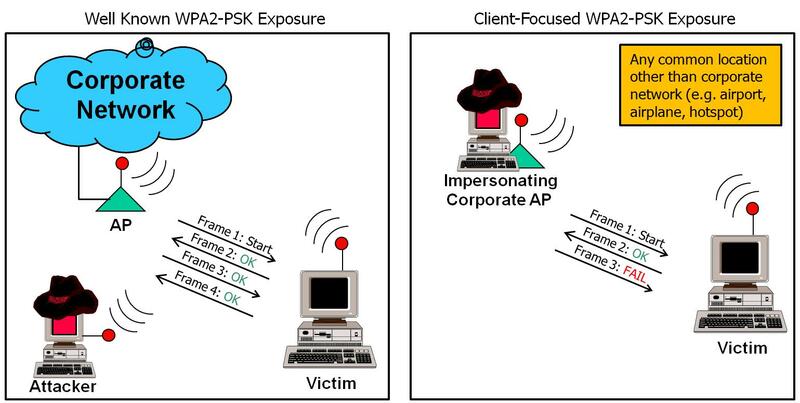 On the left is an example of what I consider a traditional WPA2-PSK attack. The attacker gets within physical proximity of the target network and waits for (or coerces) the 4-way handshake between an AP and a valid client system. On the right, however, is a less-understood attack scenario. 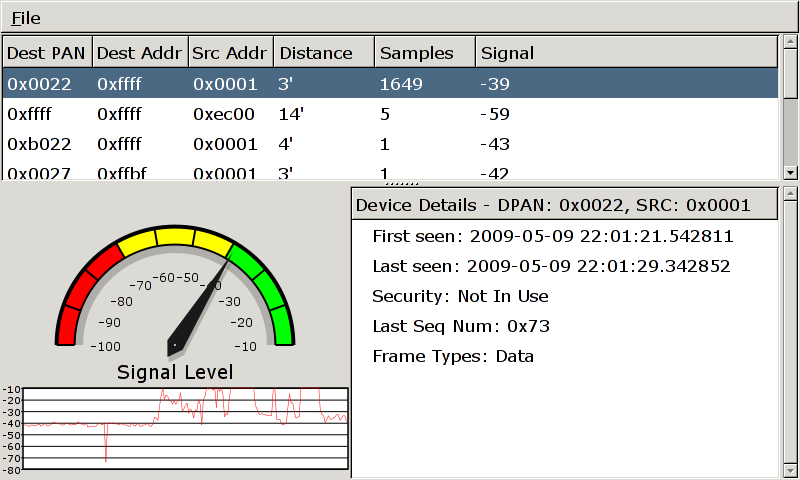 In the 4-way handshake, the client system authenticates first, sending a HMAC-MIC of frame 2 to the AP. If an attacker impersonates the legitimate SSID of the network, they are able to send Frame 1 of the 4-way handshake (no authentication) and observe the HMAC-MIC of frame 2. 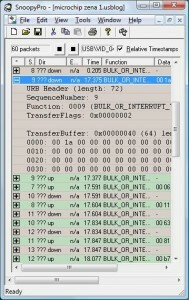 At frame 2, the attacker has everything they need to recover the PSK (now with cowpatty’s “-2” option). Frame 3 fails validation by the client, but by that point, it’s too late. In practice, I’m testing this using HostAP running on my attack workstation, but that’s not even necessary. 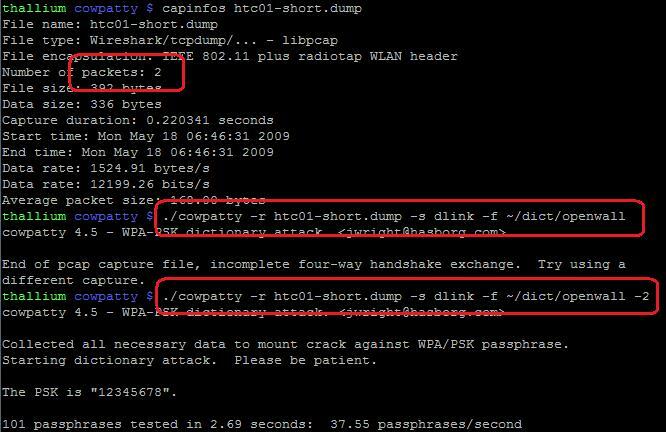 Simply take any SOHO AP, configure the SSID to reflect that of your vistim with any pre-shared key and observe the exchange between the victim and the imposter AP, supplying the packet capture to coWPAtty with the “-2” option. My transition to work for InGuardians has given me a chance to spend more time on penetration tests. As a result, I’ve started to change my mind about the value of “weaponized” attack tools. If the tool isn’t reliable, works under many circumstances and flexible enough to withstand an error or two, it takes much longer to be useful, and that costs your customer more. I’m using this as a motivator to make tools more effective, capable of demonstrating a point, and thereby allowing you to providing greater value to your customer. I’d love to hear comments and questions. Please add a comment below, or send me a note. Wlan2eth is a tool I wrote to convert 802.11 packet captures into Ethernet-style captures; I find this useful when working with various sundry tools that don’t properly handle 802.11 frames. Turns out I didn’t have support for other 802.11 packet capture link types (Adrian was using PRISM_AVS). I’ve updated wlan2eth to fix this issue, while adding support for Ad-hoc network captures as well. Since the introduction of the ZigBee-2004 specification, the ZigBee Alliance has made significant improvements in the security of sensor-based wireless networks. Despite improvements introduced in later amendments including the ZigBee-Pro specification, the security is not bullet-proof, due to the significant constraints of CPU, flash and memory availability in low-cost devices. Designing around these constraints, the ZigBee Alliance has made reasonable security options available to vendors of ZigBee products, broadly classifying security levels into high-security mode (intended for enterprise applications) and low-security mode (intended for residential applications). 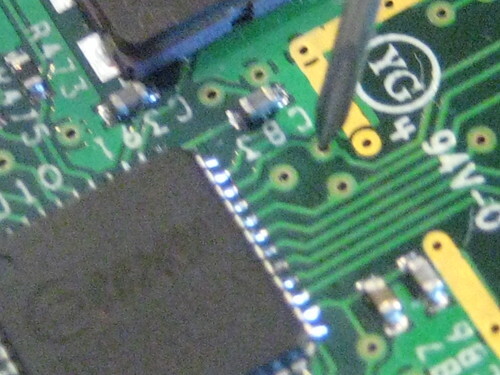 Looking at the available offerings for ZigBee stacks from vendors such as Atmel, Microchip and TI, it is apparent that high-security mode costs more, not necessarily in software costs but in terms of memory, flash and CPU requirements. Effectively, if you use sensor-based networks, and an adversary is able to steal a device, they can extract key information from the hardware which can be used to exploit the rest of the network. This style of attack has been demonstrated by my neighborly colleague Travis Goodspeed on multiple occasions, snagging encryption keys, dumping device firmware and many other interesting hacks with hardware in hand. Following Travis’ article, a few people submitted posts indicating that while his attack is interesting, it requires hardware to be effective. Today, we’re a little bit closer to making that reality. Following my previous work on reversing the Microchip Zena ZigBee sniffer, I put together a quick Linux tool to passively sniff for the presence of ZigBee/802.15.4 devices and display some summary information about the identified devices. 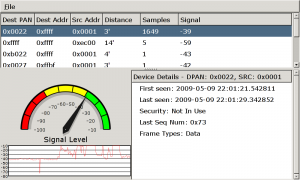 When a device is selected in the GTK UI, a speedometer needle and histogram will record the relative signal strength of the selected device with a relative distance estimate in feet using the free-space path loss formula. A screen-shot is displayed at the top of this post. 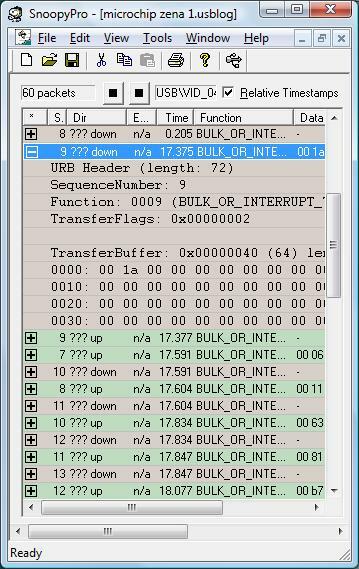 Readers from my SANS Ethical Hacking Wireless course will recognize this UI; it’s based on a tool Mike Kershaw and I wrote for Bluetooth analysis (that has yet to be released, but we have big plans for it, stay tuned). This initial code is a little rough around the edges, but provides a simple interface to track down and identify ZigBee and other 802.15.4 devices in the area. I’m holding off on releasing this tool until I iron out a few more bugs, but am happy to share the code individually if folks 1. have a Microchip Zena Sniffer and 2. have experience with Linux and Python. Drop me a note if you are interested and meet these conditions (I don’t mean to be unfair, but I want to spend my time working on the code to add features and fix bugs instead of helping users, at the moment; thanks for understanding). My goal in releasing this tool is simple: provide administrators with the firepower to justify the added cost of enterprise-security ZigBee technology with hardware tamper-proof security features. If the tools don’t exist publicly, many people disregard the threat. By making this tool available, I’m hoping people will be able to use it as an argument to justify more expensive ZigBee hardware deployments where warranted by security policy.